We are the first Dental Practice in Leinster and only the third in Ireland to introduce OralID to our patients. This new US developed technology to aid in discovering oral cancers at an earlier stage. As with all other cancers, the earlier a lesion is discovered, the better the future outcome for the patient. Approximately 42,000 people in the United States were newly diagnosed with oral cancer in 2013. In 2013, among the 42,000 diagnosed with oral cancer in the United States, 18,000 will not be alive in five years. Oral cancer’s incidence rate has increased the last five years in a row. In 2007, oral cancer’s incidence increased by 11 percent. Oral cancer’s high mortality rate is due to late-stage discovery (Stage III and IV). The mortality rate for oral cancer is higher than the rates for cervical cancer, Hodgkin’s lymphoma, laryngeal cancer, testicular cancer, thyroid cancer and skin cancer. The figures for Ireland indicate that about 450 people per annum are diagnosed and the mortality rates are similar. 40 percent of oral cancers are found in patients who do not present with any of the traditional risk factors or any other significant lifestyle risks. This means all patients, regardless of age and lifestyle, need an oral exam that looks closely for abnormal tissue. 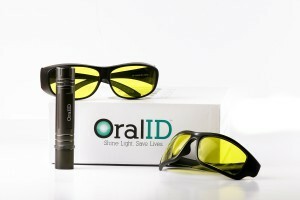 OralID’s fluorescence technology uses a blue light that allows us to identify oral cancer, pre-cancer and other abnormal lesions at an earlier stage, thus saving lives. The process is straightforward and non-invasive and only takes a few minutes to complete.